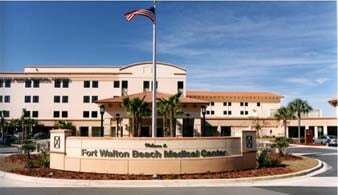 Fort Walton Beach Medical Center , with 257 licensed beds and a medical staff of over 200 physicians, representing more than 30 specialties, is the only full service acute care hospital in our Tri-County area. According to the twelfth annual HealthGrades Hospital Quality in America Study, FWMBC is ranked among the top 5% in the nation in Spine Surgery and General Surgery for the fifth consecutive year, in the top 10% in the nation in Overall Orthopedics for the sixth consecutive year and in Cardiac Surgery in 2010. In addition, the Medical Center is Five Star Rated in Coronary Bypass Surgery, Bowel Obstruction, Hip Fracture Repair, Spine Surgery, General Surgery, Appendectomy, Overall Orthopedic Services, Back & Neck Surgery. The Heart Center at Fort Walton Beach Medical Center , with the area’s only comprehensive cardiovascular program, provides the latest and most advanced treatments in cardiac care including: beating heart surgery, endoscopic vein harvesting, and cardiac catheterization with coronary angioplasty and stenting. Fort Walton Beach Medical Center is the TriCounty areas only Advanced Primary Stroke Center accredited by The Joint Commission. In achieving this designation, the Medical Center has demonstrated that its stroke program follows national standards and guidelines that can significantly improve outcomes of stroke patients. The Cancer Care Center is the area’s only comprehensive cancer care program certified by the Commission on Cancer of the AmericanCollege of Surgeons. The Cancer Care Center’s program offers the latest in technology and treatment options as well as experienced oncology nurses, multidisciplinary support teams, education and resources for the cancer patient. The Center for New Life includes a 10 bed state-of-the-art Level II Neonatal Intensive Care Unit (NICU) for premature newborns, and full term newborns with special care needs. The newly renovated center provides private postpartum suites where mothers and family members can now enjoy their newborns in a more private setting. Fort Walton Beach Medical Center also offers a six-bed Cardiovascular Intensive Care Unit, a 10-bed Coronary Care Unit, a 13-bed Intensive Care Unit and a 33-private room Progressive Care Unit in addition to its Medical/Surgical Unit, Obstetrics/Women’s Services Unit, Pediatric Unit, Rehabilitation Unit and Psychiatric Unit. Other services include a state-of-the-art outpatient surgery center, the most advanced diagnostic services and a 22-bed emergency room (open 24 hours daily) and a seven-bed Express Care for minor emergencies (open 10 a.m. to 10 p.m. daily). Fort Walton Beach Medical Center also operates the DestinEmergencyCareCenter open 24/7 at 996 Airport Road in Destin. For more information regarding Fort Walton BeachMedicalCenter’s services visit our web site at http://www.fwbmc.com/. -Voted Best Beach In The South and Top Family Destination 13 years running by Southern Living Magazine readers. -Recently picked as the #1 Beach in America by USA Today readers. -Ranked #2 on the Business Vitality Index by Moody’s Economy.com. -Ranked #13 SmallCity on the Boomtowns of 2007 by Inc.
Military The area supports Eglin Air Force Base, the largest military base in the world. The Air Armament Center at Eglin is responsible for development, acquisition, testing, deployment and sustainment of all air-delivered weapons. The Eglin Complex also houses Hurlburt Field, home of the Air Force Special Operations Command, and Duke Field, home of the 919th Special Operations Wing. The economic impact of the combined military presence in the tri-county area is an estimated $6.7 billion. The presence of the multi-service military units at Eglin results in a greater density of technology-based and defense-contracting firms creating industry clusters. Seven of the ten largest defense contractors in the State of Florida have a presence in OkaloosaCounty. Additionally, the Army’s Elite 7th Special Forces Group and the Air Force’s F-35 Joint Strike Fighter Initial Training Center are making Eglin their home and will bring an estimated 10,000 people to the area. Visit their web site at http://www.okaloosaschools.com/. Northwest Florida Panhandle "Emerald Coast"